Can we grow tomatoes in our outdoor learning environment? In December 2010, the ban on growing tomatoes in outdoor learning environments at licensed childcare centers in North Carolina was lifted. Tomatoes can now be grown in the outdoor learning environments of children three years of age and older, as long as proper supervision is in place. Tomato plants are not recommended for infant and toddler areas. Note: As of last year the NC Pre-K program became part of the Division of Child Development and Early Education. Previously the downloadable document was available at the Office of Early Learning website. NLI is making this document available here for convenience, but updates and revisions may appear and future inquiries should be directed to this website. Cherry tomatoes growing happily in a raised planter. 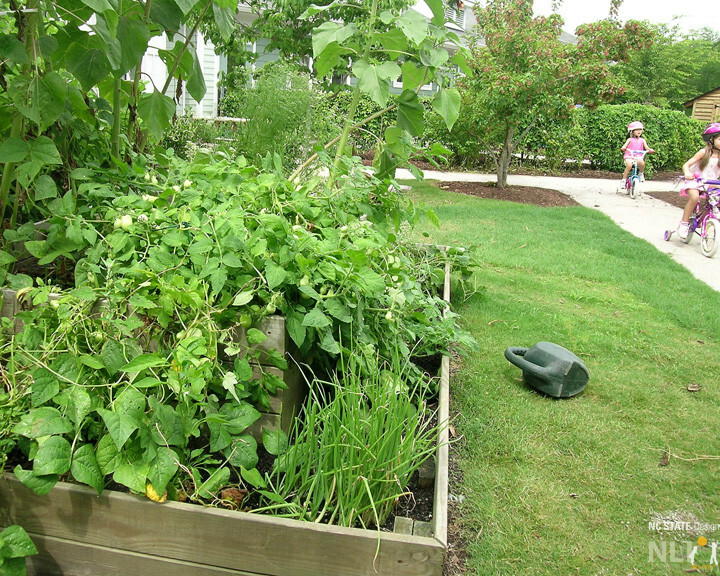 Tomatoes grow happily amongst other edibles as two children cycle by.